C H BRADLEY (1904) The steam tug C H Bradley became a total loss at Saint Michael on October 12, 1904. The light draft 20 ton steam tug had been built at Ballard, Washington in 1898 for lighterage and harbor duties at Saint Michael. CALEB CURTIS (1899) The schooner Caleb Curtis was lost in August of 1899 at Nome. 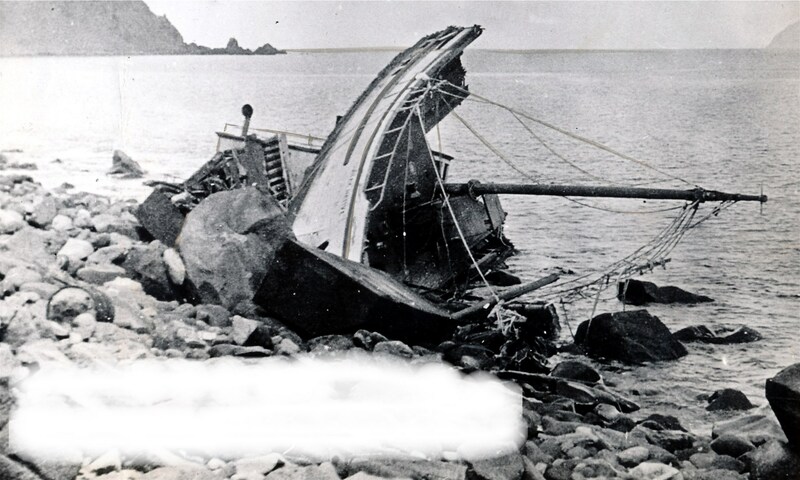 CASCO (1919) At 6:30 p.m. on Monday September 8, 1919 the 93 ton wood schooner Casco stranded on the SE side of King Island in the Bering Sea while seeking shelter from a NW gale. A kedge anchor was put out to try to pull the Casco free. “The vessel sank in two fathoms of water on the 10th day of September and remained intact until the 23rd of September when a SE gale broke her up completely.” The Casco was commanded by C L Oliver of San Francisco and had a crew of 28. Owned by the Northern Mining & Trading Company of San Francisco, she had departed Unalaska July 4, 1919 bound for the north coast of Siberia. The Casco was reported to have no cargo aboard at the time of the loss and was valued at $2,000 with no insurance. Additional Information: Built in 1878, Registration Seattle, ON 125809, Weather moderate NW gale foggy rough seas evening, Assistance none. CATHERINE SUDDEN (1900) The barkentine Catherine Sudden was driven ashore at Cape Nome by a strong gale on September 7, 1900 and became a total loss. She was valued at $50,000 with cargo at the time of the accident. The 386 ton vessel was built by Hall Brothers in 1878. CHALLENGE (1900) The 37 ton two masted power sealing schooner Challenge blew ashore during a storm at Nome in 1900 and became a total loss. CHARLES D LANE (1901) The 325 foot iron steamer Charles D Lane stranded in a thick fog at Cape Mohican on the NW end of Nunivak Island at 11:06 p.m. Saturday July 13, 1901. By the evening of July 16th the vessel was filled with sand and water. The 53 crew and passengers took refuge in the Schooner Vega, which the Charles D Lane had been towing, and returned to Nome. CHARLES H HAMILTON (1900) The river steamer Charles H Hamilton was lost at Point Romanoff 30 miles SW of Saint Michael on September 6, 1900. She had left the mouth of the Yukon River bound for Saint Michael. CHEECHACO (1920) The nine ton wood schooner Cheechaco was destroyed in a storm at 6:30 p.m. on Monday November 8, 1920 at Port Gambell on Saint Lawrence Island. She had been stored high on the beach on blocks for the winter and was attended. Her owner and master was Busha, a local native. A strong gale and unusually high tide allowed the vessel to go adrift. A group of natives attempted to hold the vessel with lines fore and aft but the high seas prevailed and the Cheechaco went adrift. She ended up pounding to pieces on the rocks and beach. CHEROKEE (1969) The oil screw Cherokee stranded and was lost November 5, 1969 at Golovnin Bay. CLEONE (1877) The 347 ton wooden whaling bark Cleone was lost in St Lawrence Bay on St Lawrence Island in 1877. Captain Nye was at the helm of the New Bedford vessel which was valued at $35,000 at the time of the loss. CLEVELAND (1900) The 258 foot iron steamer Cleveland stranded at Cape Rodney in a rough weather snow storm at 3:45 in the morning, Tuesday October 23, 1900. There were 29 crew and 10 cargo handlers on board. The Cleveland was carrying a cargo of 300 tons of coal. The strong current and heavy weather pushed the vessel off course where she stranded and sank. The passengers and crew were rescued from the beach by the Revenue Cutter McCullock. One man, 27 year old 2nd Mate F Edwards of Germany was lost. The vessel was valued at $50,000 and cargo $1,000 neither insured. The Cleveland was anchored outside of Nome when the storm came up and put to sea for safety October 22nd. CORNELL NO 10 (1982) The 130 foot barge Cornell No 10 grounded and sank July 31, 1982 approximately 22 miles west of Carter Spit in Kuskokwim Bay. Comment: The Daily Gold Digger reported August 17, 1905 that the Coryphene was being dismantled and what cargo could be, salvaged. The Nome Nugget also had similar reports. CROWN CITY (1942) The 5,433 ton 410 foot oil screw Crown City stranded and was lost on Sledge Island September 1, 1942. The vessel was carrying foodstuffs, mobile machinery, Quonset huts, clothing, coal, ore, gasoline, airplane parts, and had a deck load of lumber. Much of the cargo was salvaged. CUB NO.2 (1928) The 13 ton wood barge Cub No 2 parted an anchor line in a storm at 5:00 a.m. July 26, 1928. She was washed ashore and quickly broke up near where she had been anchored at Saint Michael Harbor. The Cub No 2 was empty and valued at $300 with no insurance.